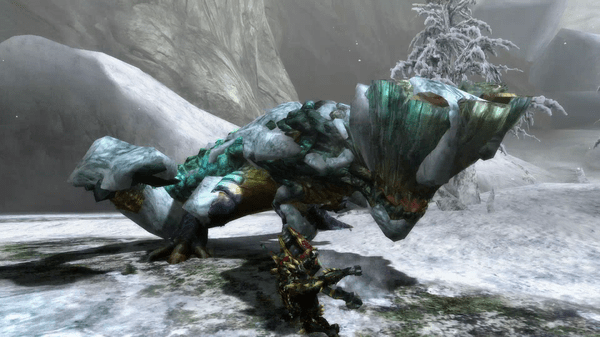 With Monster Hunter 3 Ultimate slated for release on Wii U and 3DS in two weeks, Capcom is presenting details on some of the new monsters that hunters will be seeing in the new game. Today, we’re looking at the Jade Barroth, a new monster that can be found in the icy Tundra map. Veteran hunters may remember the original Barroth, the burrowing, charging Brute Wyvern that frequented the Sandy Plains map in Monster Hunter Tri. Jade Barroth follows many of the same attack patterns as its desert counterpart, but with a few key differences. Whereas hunters could generally predict Barroth’s movements during a charge, the Jade Barroth is able to perform a large, sweeping charge that covers much more ground. Additionally, while Barroth was chiefly a close-range monster, Jade Barroth is able to scoop up large chunks of ice with its head and fling them at hunters. Hunters should take care to avoid Jade Barroth’s ice attacks. Aside from these changes, Jade Barroth fights similarly to the original, albeit with emphasis on ice instead of mud. Jade Barroth covers itself in snow and ice, which it will periodically attempt to shake off and cover hunters in. Those caught in the shower will suffer the Snowman status, and temporarily be unable to attack or use items. The standard headbutt and tail sweep attacks seen with Barroth are also used by the new subspecies. Monster Hunter 3 Ultimate will be released on March 19, when hunters will be able to test their skills on the Jade Barroth and a wide variety of other monsters. In the meantime, the Wii U and 3DS demos are available now on the Nintendo eShop.